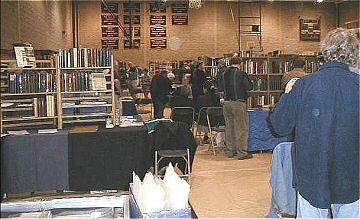 On Saturday, October 19th, the Massachusetts & Rhode Island Antiquarian Booksellers held their annual fall book fair at the site of the Historic Springfield Armory in Springfield, Massachusetts. It was the second year for the fair in this venue. For the last decade MARIAB’s fall show has been a veritable Flying Dutchman of a fair — moving from Wilmington to Andover and now to Springfield — and hopes have been running high that this is the location in which the fair will at last find a permanent home. There is much to like about the Springfield venue. The fair is held at the height of the “leaf peeping” season, when the fall foliage of Western Massachusetts is at its most gorgeous. A day-trip to the area on a fine October Saturday is an appealing prospect, indeed, to many from New England and beyond. The building offers plenty of visitor parking, as well as easy access for vendors to load and unload their merchandise. The exhibition hall is spacious, with more than enough room for the 50+ dealers to display a wide range of material — from ephemera to modern first editions to antiquarian rarities. This is a user-friendly fair known for its amiable, helpful dealers, with something on hand for just about everyone and just about every budget. “We gave out tickets at our shop before the fair to some customers who had never been to an event like this before, and saw them at the show carrying packages. It can open up a whole new world of book collecting for people.” reports Eugene Povirk of Southpaw Books in Conway, Massachusetts, whose booth offered an amazing cornucopia of books, pamphlets, and ephemera having to do with the history of political movements and social reform in America. Eugene is the co-manager of the Whately Antiquarian Book Center, a multi-dealer shop 20 miles north of Springfield, and it was at the Whately shop that he distributed tickets prior to the fair. Several of the exhibiting dealers reported a high degree of customer interest and good sales. The fair “attracted a steady crowd, the booth was busy all day, and I’ve had a couple of good follow-up sales afterward. Considering it’s only the second year at this location, the show showed potential.” says Russell DuPont of Whitman, Massachusetts, who filled his booth with an attractive selection from his extensive inventory of books on the fine and decorative arts. Although many dealers agree with this assessment that the fair has great potential, there is at the same time a general agreement that this potential is currently not being met. Also, it must be admitted that more than a few exhibitors voiced concerns over slow sales and lower-than-anticipated attendance. It appears that, for all its positive qualities, the fall MARIAB fair is still undergoing growing pains. Several dealers suggest that the location is not yet well established enough, that people have difficulty finding it, and that more effective publicity is needed, as is more visible signage at the fair itself. 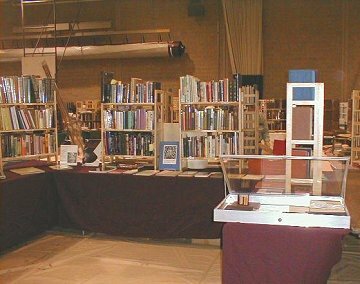 Ken Haverly manned the booth for our shop (Meetinghouse Books). In order for visitors to get the flavor of our South Deerfield shop, we put together an eclectic selection of scholarly and literary books, a feature display of several works by Harriet Spofford (a 19th Century New England writer known both for her works of gothic fiction and for her expertise in the decorative arts), and some vintage paperbacks just for fun. We had also been handing out tickets in the shop in the weeks preceding the event and, as Eugene reported, quite a few of these customers did attend the fair. Some of them visited the our booth to thank us for the tickets — and mentioned that had it not been for the tickets they had received at the shop, they would never have known about the fair at all. Meanwhile, on the day of the fair I was back home running the shop and was quite taken aback to discover that only one of the shop’s customers that day had been aware of the fair’s existence before I mentioned it. 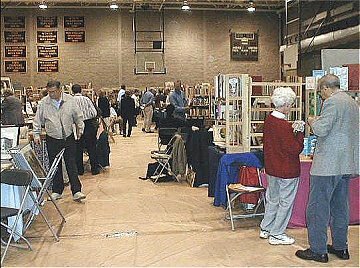 Although there is obviously a need for improvement in getting the word out about this fair, there is little doubt that it is “a good venue to spend quality time with people who enjoy our obsession” in the words of Margo Turpening of Andover, Massachusetts. 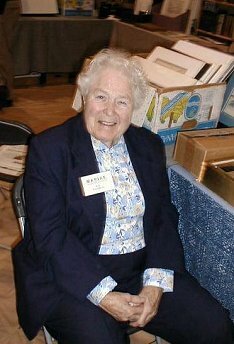 Margo, who is known as the “Mad Hatter” and who specializes in automobilia, travel, and exploration, is one of those special booksellers whose infectious enthusiasm epitomize the charms of this fair and make it such a joy for exhibitors and customers alike.